UPDATE: The boy was found alive, hiding in a box in the attic of the family's Colorado home. Something tells me he was afraid of getting into trouble after setting the balloon loose. And this makes the story this year's biggest news that wasn't really news - and it had the whole world watching. Many of you have been following the news of the 6-year-old boy, Falcon Heene, who was thought to be in a homemade hot-air balloon that floated away in Fort Collins, Colorado (reaching heights of 7,000 to 8,000 feet), which recently landed without the boy on board. Authorities are afraid the boy might have fallen out. In researching the Heene family, it was discovered that the Heene family appeared on ABC's Wife Swap. 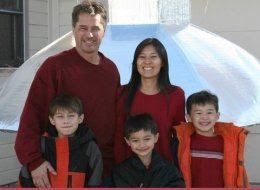 "Wife Mayumi (43) and storm scientist Richard (45) take their three kids, Bradford (8), Ryo (7) and Falcon (5), out of school to go on storm chasing missions to prove Richard's theories about magnetic fields and gravity. If conditions are right, Mayumi wakes her family by shouting "Storm Approaching, Storm Approaching!" into a bullhorn. The family sleep in their clothes so they can leap out of bed and into the storm-mobile. Richard calls Mayumi his 'ninja wife'; she maintains equipment, drives the storm-mobile, films tornadoes and waits with the kids while Richard jumps on his motorbike, heads into the eye of the storm and launches rockets to measure magnetic forces. At home the family are as chaotic as a twister: the kids have no table manners and throw themselves around the house, and while Richard devotes every moment to his research, he expects Mayumi to cook, clean and run the house without any help." "When the Heene family (pictured left, photo courtesy ABC.com) aren't chasing storms, they devote their time to scientific experiments that include looking for extraterrestrials and building a research-gathering flying saucer to send into the eye of the storm. In this ultimate swap, the Heenes swap lives with a psychic mom who speaks to the dead and can control the weather, her husband and her children -- who believe they are destined to be stars. This show will feature aliens, punk rockers, past-life regression and, for the first time ever, the children from the two families will face off in a kids' table meeting. "Heene/Silver," the 100th episode of Wife Swap, destined to become a classic!" 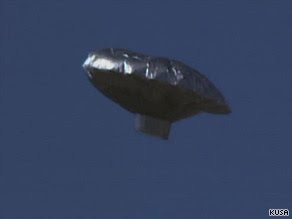 Apparently the balloon was to be a part of a science experiment.